I went to the Farmers Market on Saturday to get my fix of delicious organic foods. Visiting my favorite stands to see what they had, I came upon a new food that I have never seen before, Purslane. 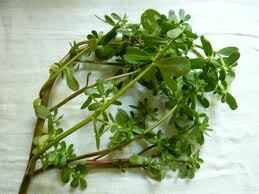 What is Purslane I asked my local farmer. He told me it is an edible green that you can put into salads that has a sweet taste to it. He let me try a leaf. My first thought was that it was watery and sweet. He said it was in the succulent family. Well, always willing to try new things, I bought up a bag of it. I went home and used it in my breakfast that weekend. It was delicious! I mixed it with raw curly kale, chopped baby tomatoes and an over easy egg on top. I definitely enjoyed my new green! What is purslane though? I like how it tastes, but what about its benefits? Why should I eat it? Well after some research, I have found it to be quite nutritious on top of being delicious! 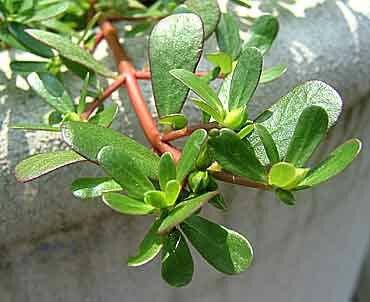 Purslane, Portulaca oleracea, contains alpha-linolenic acid, one of the components of omega-3 fatty acids. It actually has the highest content out of all the leafy vegetables. Other foods high in omega-3 are flax seeds, fish and algae. It is also high in vitamins A, B, C and E as well as high in minerals calcium, magnesium, pottasium and iron. 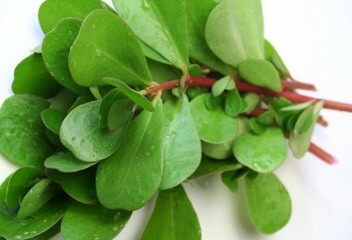 Purslane is eaten in many cultures all over the world, but in the United States it is considered a weed. It has a sweet and sour taste. It can be foraged during the summer, but beware of poisonous spurge that grows near it, which will exude a white sap when broken. And of course it is also a Chinese Herb! In the Chinese Materia Medica it is called Ma Chi Xian. It is in the Clear Heat category and goes to the Large Intestine and Liver. It is sour, cold and slippery. I am pretty sure this is the only slippery herb in the materia medica! In Bensky (2004), he states that it is used for clearing heat toxins in disorders such as dysentery, painful urination and carbuncles and sores. It can also be used as an antidote for the pain and swelling of wasp stings and snakebites. Here are some Purslane recipes for you to enjoy! Add just enough water to blend until smooth & Enjoy! Bensky, Dan. (2004), Chinese Herbal Medicine Materia Medica. Seattle: Eastland Press. Next postAcupuncture Needles, See For Yourself!